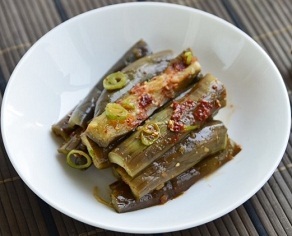 Gaji namul is a delicious, healthy Korean side dish that is made with eggplants. Clean eggplants are first steamed, then torn by hand and marinated in soy sauce, minced garlic, green onions, gochugaru (red chili pepper flakes), sesame oil and sesame seeds for added texture. It's usually served cold as part of a Korean meal or simply as a vegetarian dish on its own with steamed rice. Keep in mind, eggplants in general are known to be very healthy where it can reduce carcinogens from forming, neutralizing cancer-causing agents in your body. It's a great source for vitamin & minerals and it's a perfect left-over side dish to use in bibimbop.